Review of North State Natural Wood Extra Wide Swing Baby Gate, 60"-103"
North State Natural Wood Extra Wide Swing Baby Gate, 60"-103"
Affordable and quick option for small spaces. Door swings in either direction for easy access. May not be strong against children or animals weighing more than 10 lbs. 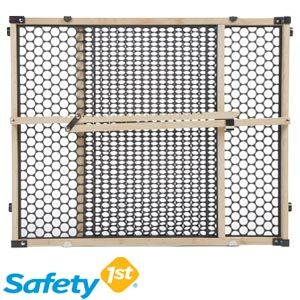 This is the summary of consumer reviews for North State Natural Wood Extra Wide Swing Baby Gate, 60"-103". The BoolPool rating for this product is Good, with 3.90 stars, and the price range is $45.00-$50.00. The North State Natural Wood Extra Wide Swing Baby Gate is perfect for consumers who need to block off a wide doorway or room with a simple and sturdy foot-tall structure. The natural color of the wood blends in with all kinds of households and is adjustable to fit from 60’’-108’’ widths. The structure is strong enough to withstand children or animals climbing on it and prevents any breakthrough, but is simple enough to open the swinging door with a single touch by an adult. This affordable but wide-adjustable product is versatile enough to move between doorways and rooms quickly and simply by adults, each panel being incredibly lightweight. 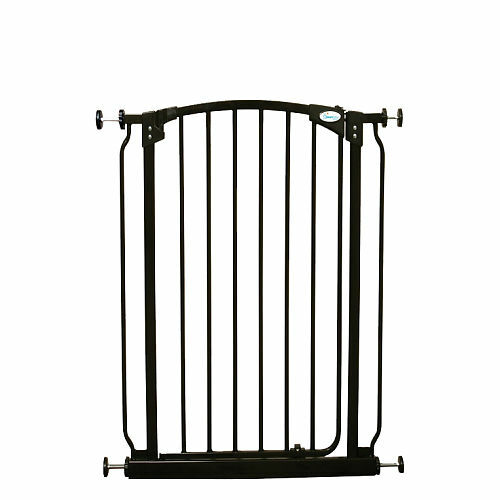 Some customers are disappointed in the overall strength of the gate, saying it is easily broken, snapped, or pushed over by children, which poses obvious safety concerns. 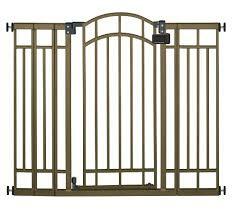 Also, others say for the price, there are other gates made of more stable materials that last longer. Overall, this product is best for someone with a very small child or animal and is looking for a trustworthy product that is lightweight, easy to move and travel with, and blends into households with light colors and delicate decor. I bought this for the extra width and it delivers for that. The gate is very long and was able to stretch the entire width of our entrance but wasn't very strong. Overall, I'd recommend it if you're using it in a doorway on the smaller end of the spectrum or with small pets or a less rambunctious child, but otherwise, you probably should upgrade. I think this gate will be sturdy enough to keep my 16 month old out of the kitchen, but I can't imagine it being sturdy at all for a larger opening. Not sturdy enough even for a 15 lb puppy, plastic gates are much better. CON: Not very sturdy and the latch is a pain. Could have been a little more sturdy but at half the price of any other gate this size i can't argue. Granted it wasnt expensive but i thought it'd be a lot more sturdy than it was. Not made with good quality materials. Had to go buy longer eye bolts but otherwise this gate is great my 9month old son loves to hold on and bounce it or shake it and it holds strong. I've a 3 year old and a 10 month old that can break right through it. My advice is to spend the extra money to get a good quality strudy gate for your children. It works great. I love the fact that it swivels, so I have the option to block one side or swing it around to give him more room! This one works great and helped us declutter a lot. if you don't plan on actually opening the gate, it should work just fine. I'm sure had this arrived in working condition I'd have been pleased with it. as a swinging gate, i wish i'd spent a little more and gotten one that works well. I loosely tied it to the fence post so there'd be enough "swing" and it works perfectly!!!!!!!!!! It works great I love the fact that it swivels so I've the option to block one side or swing it around to give him more room!!. dont hesitate to get this if it doesnt work for u , u can always bring it back to the store. We needed a wide gate to keep our 20 month old out of the dining room. well u just have to use anchors or drill it into the studs. Just what I needed for large room doorway to keep pet in hall. It seems flimsy but it works great and keeps my 10 month old out of the kitchen. Good price and keeps Toby out of trouble!. Wouldnt be able to keep my toddler out of the kitchen without it. It does it's job ( keeps baby in/out) just wish it'd fold up smaller into a single gate instead of a double gate. I'd really like to keep it because any comparable gates are more than twice the price. If you're cutting it close on the gate width, keep this in mind. This's helped us keep our new puppy from destroying our house when out for short periods of time. We use it to keep her from going into our office area & up the stairs. I also have a dog that likes to try to get through and it does it's job and either keeps her in or out. We mounted and screwed it directly into a shallow stud in the wall perfectly. My opening measured exactly 8 feet and, even with the wall screws mounted, (sticking out from the wall) the gate still didn't reach across. Very flimsy.Comes out of the wall continuously.Hard to open every time. The other end, my husband screwed a piece of vertical wood trim onto the wall with long screws, deep enough to hit a stud, and then mounted the gate hardware to the trim piece with the hardware provided. Any gate that's screwed into the wall needs to be properly anchored to prevent a child from loosening the screws in the drywall. One end we mounted and screwed directly into a shallow stud in the wall perfectly. I needed to pre-drill holes with a drill bit in order to screw in anchor screws. As long as the hooks are screwed into a stud or are properly anchored in drywall, a child shouldn't be able to yank the hooks out of the wall. This one works great for him exept that we'd to get some wall anchors because he shook the gate and the screws came out of the wall. The only critical thing that the installer must do is to make sure they drill into a stud in the wall for the eyelet screws. They're for screwing into studs, not drywall, and drywall anchors won't help you. This was really easy to install (my husband did it in about 10 min, maybe less). It's easy to install n easy to use. This was perfect and easy to install. My husband installed the gate and said it was easy. And once again it was very easy to install. Overall the gate serves my purpose well and was very easy to install. Easy ordering, quick delivery, would definitely buy again or recommend to others. This gate fits great, was an easy install, and can even be wider if I needed!!! This was one of the few gates we found that was the right size for our extra wide opening between living room and kitchen AND that we could open instead of climbing over. Summary, swings 180 degrees, opens on both sides, sturdy enough but made simply and cheap-hence price, slides in 2 spots to open or fit whatever area, easy to take off and put away if you've guests over, doesn't bend in center, very happy! I needed a gate for an oversized door opening to keep my small dogs out of the sun room as well as a two year old away from the door she's learned to open by herself. I've an opening that goes from my dining area to my kitchen and that opening has a span of 70 inches. Walmart states that it'll fit openings between 57" and 103" wide. 57 inches however is the minimum dimension when OPEN so when you slide it open, we only had 3 inches of space in which to pass. I've a really wide opening between my family room and kitchen, and wanted to keep my little explorer out. We looked everywhere for something affordable to fit our awkward bottom of our staircase: railing on one side curving open with the nearest place to attach 90 inches away on a wall. 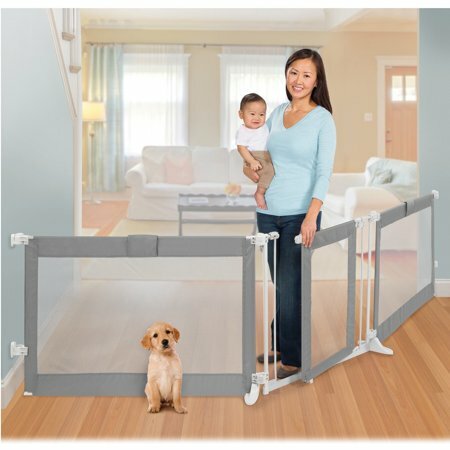 We needed a gate that'd cover the 8 foot wide opening into our living room, but it isn't that sturdy and I'm afraid that our grandson (age 14 months) or dog will eventually knock it over. We've a 106" inch wide opening between our living room & kitchen/dining room, & this was the longest gate I could find at a reasonable price (VERY reasonable!). I've a 6 foot opening between my living room and kitchen and a 20 month old that loves to climb on my counters with the dining chairs. We bought this gate for an 89inch entryway between our dining room and living room and it works perfectly. Nothing else worked that we tried to keep her out of the kitchen and dining room. We looked everywhere to find a gate that'd extend over the area between our living room and kitchen to keep our 1yr old out. I bought this to help keep my 8 month old son in our dinning room, which is being converted into a play room for the time being. 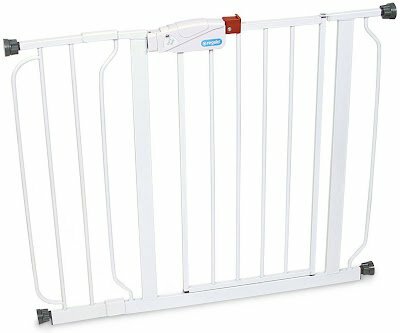 I bought this gate to put in between my kitchen and living room,to keep my granddaughter from dragging her toys in the kitchen.Also when my son comes home for a visit he brings his dog,so she'll stay out of the living room.It does the job.The only thing is I wished it'd have asomething in the middle of the gate for a little more support. So, I needed something long enough to fit between the living room and kitchen (to keep them out of there too) and that they couldn't tear down. I wanted to keep her out of the dog's room and the dog in his room. This was purchased for my nephew's kitchen with a very wide opening to the family room.